The universal waste recycling enables commercial, institutional and regulated hazardous waste-generating community to recycle common, or universal wastes which have hazardous characteristics. By recycling as universal wastes, the generator may not be required to manifest and transport them as hazardous waste with a licensed hazardous waste disposal firm. This adds conveniences and can reduce costs. As of November 2017, the MCMUA stopped accepting Fluorescent light bulbs in bulk quantities as a Universal Waste from non-residential generators. 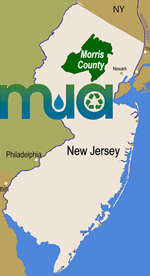 Click here for information about how to recycle fluorescent bulbs on your own or contact the MCMUA at 973-285-8394. With the 2010 USDOT change in regulations regarding the transportation of waste batteries and the MCMUA stopped accepting batteries in bulk for recycling. Those with batteries are encouraged to manage their spent batteries according to the "Easy as 1-2-3" suggestions.